Sensex – All set for New Year !! finally it seems Sensex seems to be setting up for a nice move in the next year. Currently if it is able to cross above 20300 wont be surprised to see a sharp move in near term with expiry around the corner. Ideally a move above 61% of the fall is an indication that the uptrend continues and the current move was just a healthy correction as expected. Investors should again start focussing on broader market once index closes above 20300 and 6100. Maintain the strong view on Metal Stocks – Hindalco and Tata Steel. Will also start focusing on Sterlite Inds soon if its able to cross 190 resistance. 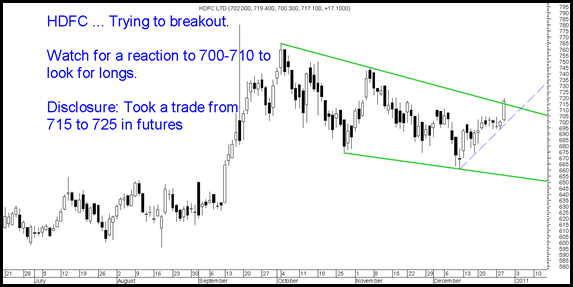 HDFC Limited has given a breakout today. Watchout for a move to 740 in coming days. Dips to 710 or lower can be bought into. Today we did a small trade in futures though. 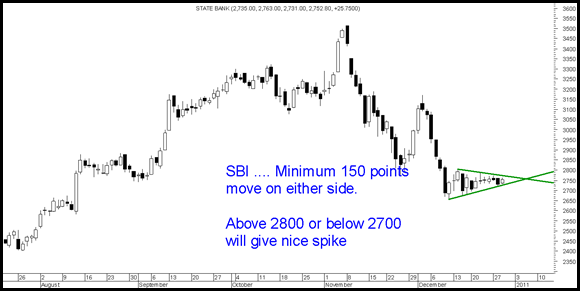 This is a classical trading setup on State Bank of India. Sustained move above 2800 or below 2700 could give a nice 150 rs trade. Stoploss would be 30-40 bucks. 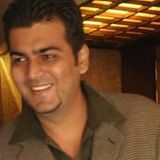 Also keep reading www.analyseindia.com for more updates as well as checkout our performance reports. Hello nooresh now that the index has managed to cross 20300 what’s ur view on jmc projects n modison metals over the next 2-3 months???? I am holding 500 midfield industries at 150. What is companys future..? Why stock is hitting LC from last month? I am in to huge losses please guide me. Its a dud company ! propped on broker funding. Was about to write an article on the same. You would be lucky to get out. Wish you, your family and entire team of Analyse India, a Very Happy & Prosperous New Year!! Hi I prefer all the four ! I am bullish on Metals for short term and Midcap IT is wat i am looking at.